With the growing demand for alternative modes of transportation, traffic calming measures are being introduced on various roadways to ensure safe travel for all users. The use of narrowed throughways, speed bumps/humps/tables,chicanes, and curb extensions (bulbouts) are some of the many features being used in the efforts to slow automobile travel, including the Union Street Reconstruction in Peterborough, New Hampshire. This project also incorporated tree plantings along the medians to beautify the area. History shows pedestrian crossings existing more than 2000 years ago, where raised blocks on roadways provided a means for pedestrians to cross without having to step on the street itself. In current designs, high visibility crosswalks are incorporated to guide pedestrians and alert motorists to the crossing locations. Six foot wide crosswalks are installed using long lasting plastic/epoxy or paint embedded with reflective glass beads to assist in the crossing markings. 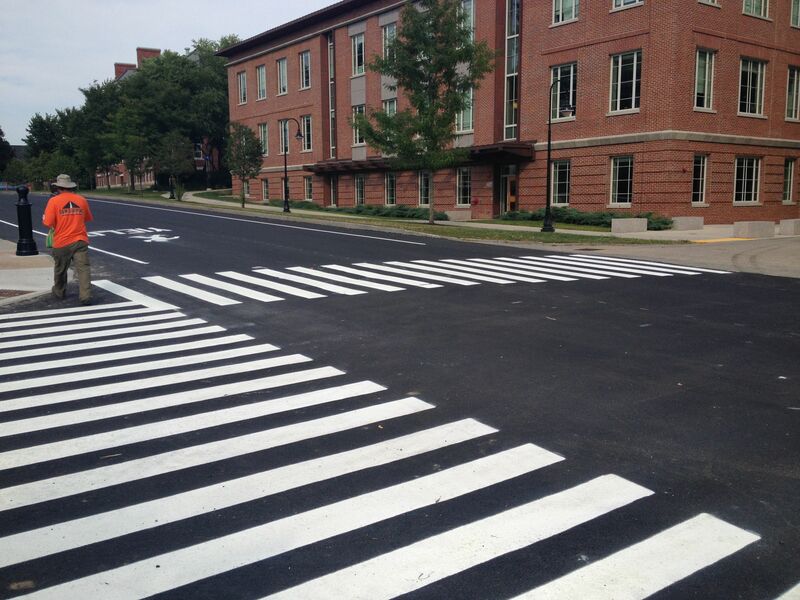 In addition to local governments, universities, like the University of New Hampshire, are incorporating these crosswalks on their campuses. A multi-use path or trail that has been separated from motor vehicle travel and has been established for alternative transportation purposes is another option that is growing in popularity. Utilizing existing right-of-ways to create these travel corridors for pedestrians, cyclists, skaters, equestrians, and other non-motorized users in some instances are also used to observe the natural environment in various communities. Recently, a shared use path was completed connecting Manchester’s and Goffstown’s trail system. Intersections have the unique responsibility of accommodating and coordinating the nearly-constant occurrence of conflicts between all modes of transportation. Multi-modal intersections focus on intersections where numerous modes of travel come together and the coordination is required for the safety of all users. Utilizing different design features such as corner refuge islands, forward stop bars, and dedicated bike lanes, as used on Manchester Street in Concord, all intersection users can travel simultaneously, safely. With many communities implementing these design features into roadway geometry, walking to work can be as simple as strapping on your shoes and heading out the door. By walking to work for this nationally recognized day, you will help reduce carbon emissions, get fit, and avoid the traffic jams.